Nicole Kidman has been shooting the new season of 'Big Little Lies' but yesterday evening(May 29th) she was on hand to introduce her husband Keith Urban who performed at the 2018 Lincoln Center's American Songbook Gala at the Alice Tully Hall in New York City. 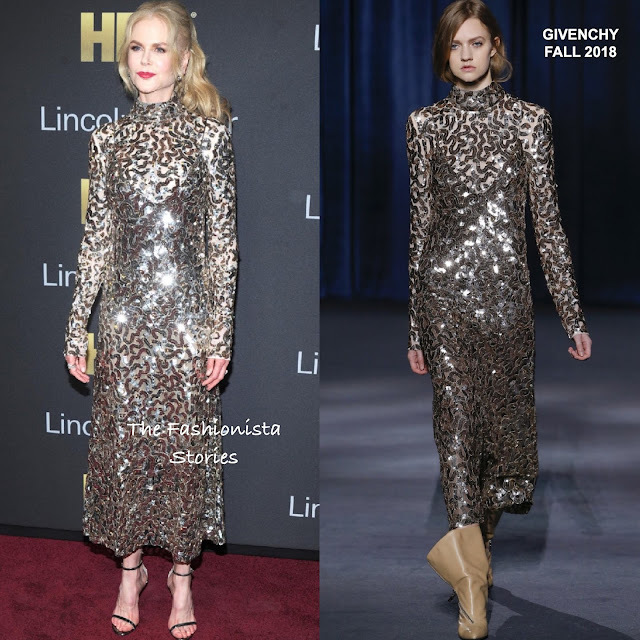 Glitter & sequin were big on the runway's for Spring / Fall 2018 so seeing Nicole in this GIVENCHY FALL 2018 long sleeve sheer sequin dress is no surprise. Her sheer dress was layered with a bodysuit for coverage. Beauty wise, she went with a half-up, half-down light wavy hairstyle with tendrils and a colored lip which topped off her look along with the NICHOLAS KIRKWOOD 'Penelope' sandals and FRED LEIGHTON jewelry. Glitter & sequins were big on the runway's for Spring & Fall 2018 and Nicole's sparkly look worked perfectly for the occasion don't you agree?